A commander from the Abu Sayyaf group, which has earned many millions of dollars by kidnapping foreigners and beheaded others after ransoms demands were not met, claimed responsibility for the latest incidents, regional military spokesman Filemon Tan told AFP. Tan said the military had recovered the couple’s yacht, and the body of a naked white woman who had been shot was aboard. 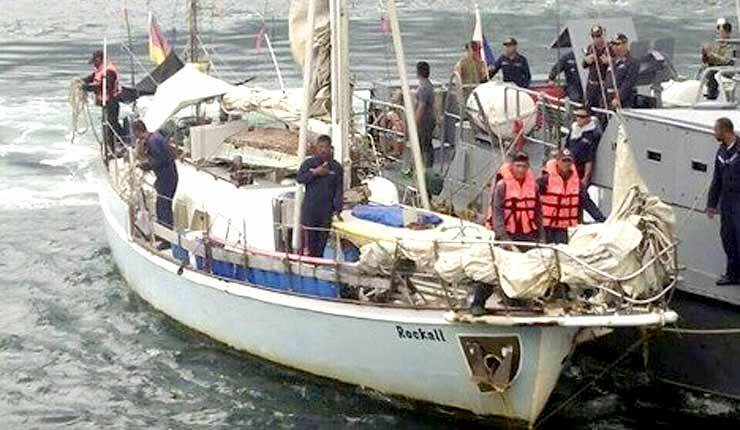 He said the military had listened to an audio recording of a known Abu Sayyaf leader claiming responsibility for the raid on the yacht, and the abducted German man also spoke on the phone call. The abducted man identified himself as Jurgen Kantner, aged 70, and his companion as Sabine, according to Tan. It appeared the victims were the same as those abducted by Somali pirates off the Gulf of Aden and held hostage for 52 days in 2008. AFP interviewed Kantner and his wife, Sabine Merz, in 2009 about their ordeal when they returned to Somalia to retrieve their boat, named the Rockall. Despite being subjected to a mock execution during his ordeal, Kantner said the threat of kidnapping would never stop him from sailing. “My boat is my life and I don’t want to lose her, nothing more. I don’t care about pirates and governments,” Kantner said in the 2009 interview from Berbera, the main port in Somaliland. The Philippine military released a photo on Monday of the Rockall and said it had a German flag on it. Tan said the passports of Kantner and Merz were found on the Rockall. He said the photo in Merz’s passport appeared to match the body of the dead woman aboard, although her identity still needed to be confirmed. The Abu Sayyaf, a loose network of militants based on remote southern islands in the southern Philippines, has defied more than a decade of US-backed military offensives against it and gone a lucrative kidnapping spree in recent years. In 2014, the militants abducted another German couple off a yacht in the southern Philippines. They released the pair six months later after receiving what they said was the full ransom demand of 250 million pesos ($5.1 million). Islamic militants are planning to kidnap foreigners in tourist hotspots of the central Philippines, roughly 500 kilometres (300 miles) from the Abu Sayyaf’s bases, the US government warned last week.